This 17th century cottage has been a tavern, an art guild, and a home. 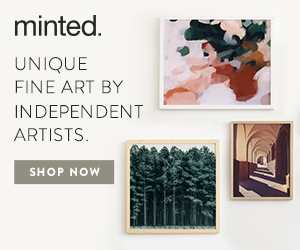 If your home had a grand history, would that change how you would decorate or remodel it? 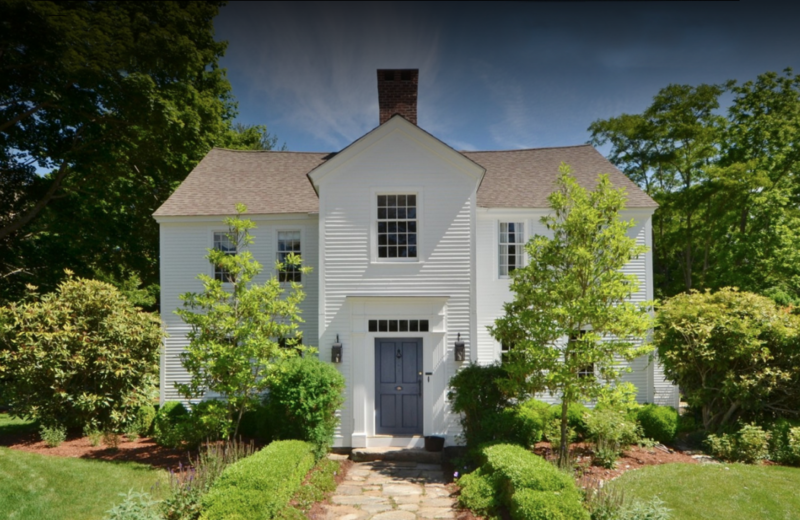 This home for sale in Old Lyme, Connecticut, dates back to the late 17th century—making it one of Connecticut’s oldest homes—and has filled many different roles. It was once known as Peck Tavern, in which George Washington danced. At one point it was also the Old Lyme Art Guild. It even has an old two-story barn on the Connecticut Historical Trust Barn tour, and the home itself is part of the National Register of Historic Places. The barn now has two car bays as well as a horse stall. But now this old home has a new look as a single-family home. 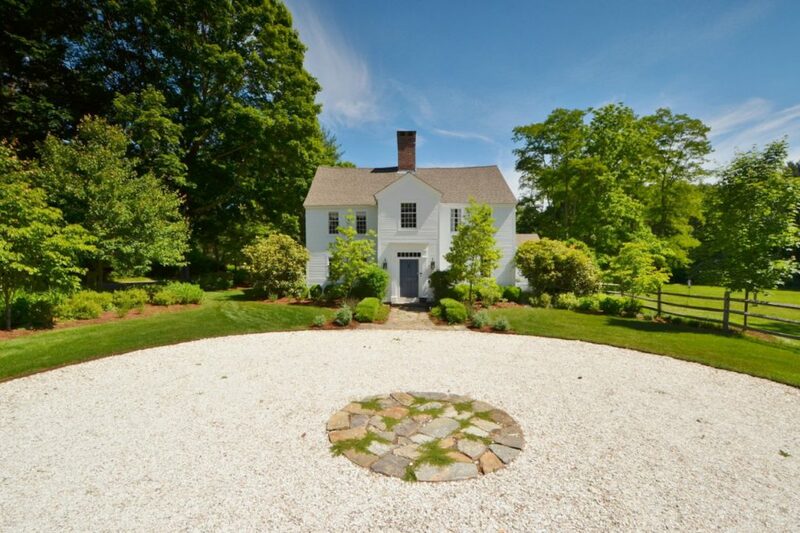 Set back on a circular driveway, the historic home hasn’t lost its grand appeal. 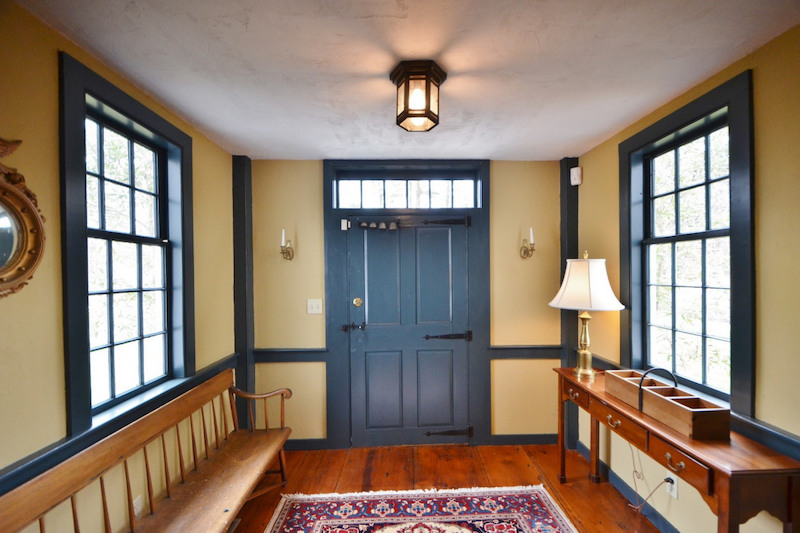 This entryway shows off the original style of the home. 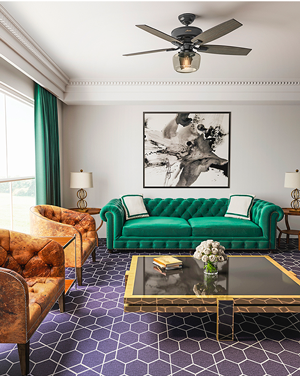 Despite renovations to modernize the home, much of the historical character is still apparent in the wide-board floors and the open fireplaces. Many of the fireplaces are original. The exposed ceiling beams and corner posts are hand-hewn. Instead of completely modernizing the inside of the home, the owners chose to keep the character through these historic elements. 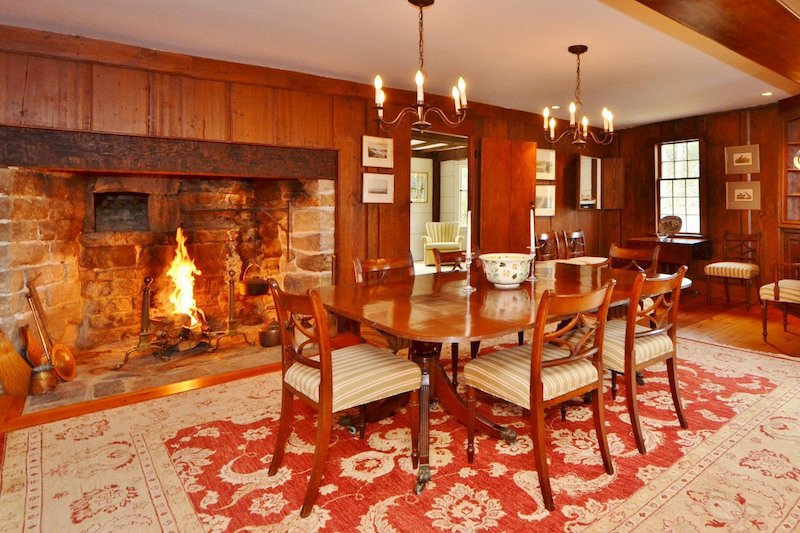 This original fireplace adds to the historical charm of this 17th century home. The renovated kitchen mixes the old and new. 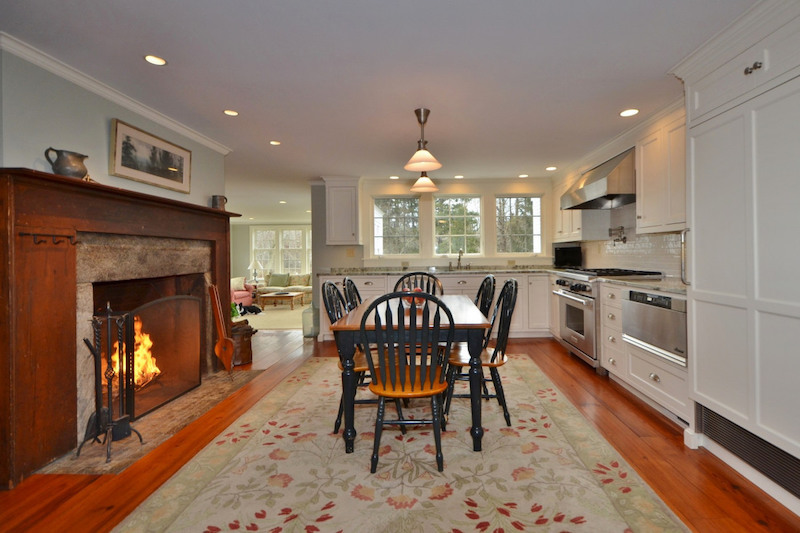 The appliances are sleek and modern, but the kitchen table and large fireplace with its wood mantle retain the historical charm. The table brings out a traditional cottage look. The old fireplace is obviously historical and adds to the cottage charm. This kitchen mixes modern and antique. The table and fireplace bring the modern kitchen to a small farm cottage. The bathrooms are also updated, though the antique charm is still there. The doors all look to be from the time period, with dark metal hinges and handles. 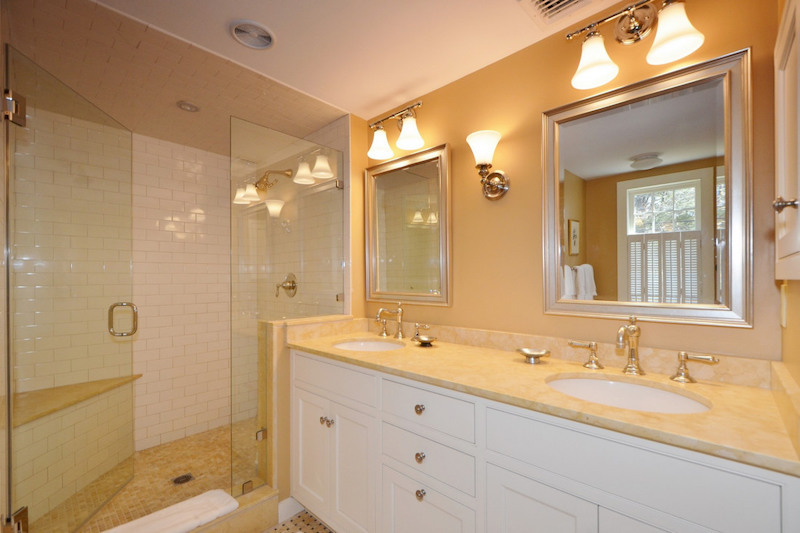 This updated master bathroom still mimics some historic elements with the faucets and mirror frames. 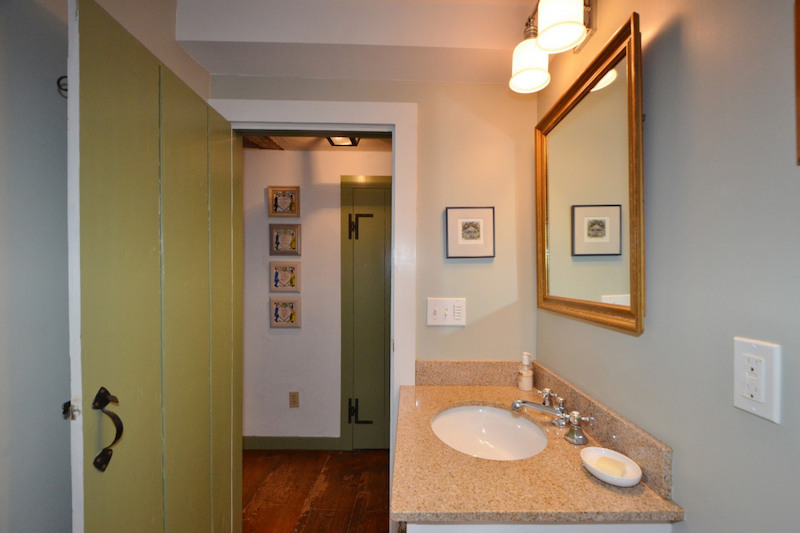 This updated bathroom still keeps its historical roots through the old door, painted to give the house some color. This home has a great history and is sure to continue adding to its story. From a tavern, to an Art Guild, to now a single-family home, this cottage is well-used. Though it has been renovated—with geothermal heating, air conditioning, and completely updated bathrooms and kitchen—this house still has many of its original historical elements. To see more about this house, visit 1silllane.com. Looking for more historic home inspiration? 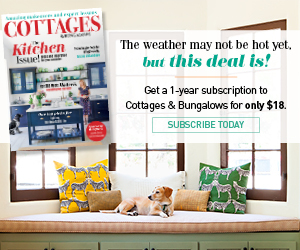 Check out this Laguna Beach cottage that gets remodeled with period style in mind.